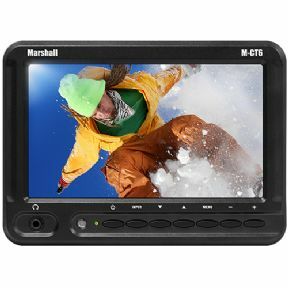 The M-CT6 monitor kit provides a lightweight 6.2" 800 x 480 LCD monitor with HDMI that is perfect for photographers and videographers looking for a simple, inexpensive monitoring solution. This unit offers two compostite video inputs and one audio input, along with HDMI and VGA (PC) connectivity. A variety of features include a 3.5mm Stereo Headphone Jack, Rear Speaker for audio monitoring, Auto Aspect Ratio Detect, Zoom, Image Flip/Flop and full Color Adjustment, and Battry saver switch. Users also have the ability to power this monitor using a standard DSLR battery*. This feature allows the monitor to be powered using an existing DSLR battery for mobile on-the-go monitoring.